Two people have died and four others have gotten sick off of soft raw-milk cheese from Vulto Creamery in New York, according to a release from the Centers for Disease Control first reported by Buzzfeed. The company has recalled those cheeses, but is there something about raw milk cheese, soft raw milk cheese in particular, could make people sick? People drink unpasteurized or raw milk for its unsubstantiated health benefits. While drinking raw milk is probably a bad idea, raw milk cheese is a different story—thanks to the importance of bacteria to the cheesemaking process, connoisseurs might think raw milk makes for a more complex or intense cheese flavor. If you get anything out of this article, it should be: Raw milk is dumb, hard raw milk cheese is fine, soft raw milk cheese is risky but your call. So, we started pasteurizing the milk....and then recently, people started drinking unpasteurized milk again. Lucey writes that some think raw milk is good for the gut health thanks to the presence of “good bacteria” like Lactobacillus or Bifidobacteria. The levels of these good bacteria are quite low in raw milk. Instead, there are often pathogens like Listeria. And when Bifidobacteria appears in milk, it’s likely the milk is contaminated with cow poop. Others think raw milk is more nutritious because the proteins haven’t been denatured, even though denaturing doesn’t seem to change the protein’s nutritional quality, wrote Lucey. There are other reasons, but “no reliable scientific evidence to support any of these suggested health benefits,” the report says. Raw milk is dumb. I couldn’t find any raw milk-specific FDA regulations althoug the Center for Disease Control and Prevention really doesn’t want you drinking it, either. Its sale and legality varies by state, and importing it requires following standards set out by the Federal Import Milk Act. 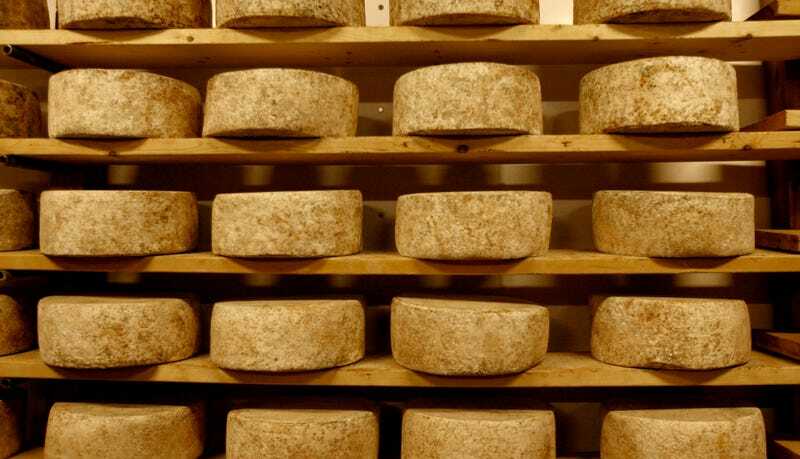 Many cheesemakers think it’s too risky for soft milk cheeses to be made from raw milk. But this is an article about cheese. Cheese is essentially pickled milk: salt, bacteria and enzymes added to milk and left to age for a while that creates an environment where pathogens can’t grow. That’s thanks to a fermentation process, where the good lactic acid bacteria eat the milk sugars and produce lactic acid. Cheesemakers leave the cheese long enough to create the acidic environment that pathogens can’t thrive in, Lucey explained to Gizmodo over the phone. The accepted safe wait time is 60 days, and the environment becomes hostile to pathogens whether you use raw or pasteurized milk. “I think that raw milk cheddar cheeses and things like that are probably fine,” he said, “As long as they’re aged 60 days.” The FDA recently analyzed a number of these 60 day aged hard raw milk cheeses—and nearly all the samples were fine. Soft raw milk cheeses, those aged less than 60 days, are a different story. The lower acidity and sometimes lower salt content means that pathogens like Listeria and Salmonella won’t necessarily die. “Many cheesemakers think it’s too risky for [soft milk cheeses] to be made from raw milk,” said Lucey. But there’s reason to use raw milk in soft cheese. Lucey said the taste is definitely a little different. The flavor from any of the naturally occurring bacteria is “probably amplified in the cheese, because they have more time to be active in it and more time to dominate or take part in it,” said Lucey. Eating raw milk soft cheese “adds risk,” said Lucey, since the pathogens still might be there. “If something contaminates the cheese, there’s a possibility,” depending on the cheese’s acidity, “that Listeria could grow in that cheese. That’s the problem. That’s adding risk.” So, if you’re a real cheese buff, just know that eating soft raw milk cheese might change the taste, but you’re assuming some level of risk. Lucey didn’t feel comfortable commenting on the Vulto creamery cheese specifically, but was just speaking generally about cheese. This isn’t the first raw milk scare, though: A CDC report found that between 1993 and 2006, there were 1,571 cases of illness, 202 hospitalizations, and 2 deaths from raw milk, amounting to 73 of 121 dairy-related pathogen outbreaks. Those eating soft raw milk cheese should definitely be aware of the risk they’re assuming by picking it over a pasteurized cheese before eating it or feeding it to their kid.